This is the latest addition to my Parisienne suite of skins. Thank you to Xiandi for very kindly helping me with the start menu (she's a star!!) It's for Windows 7 only. I hope you like it, I'm very pleased with it!! Wonderful work as usual. Thank you. Beautiful, elegant, classy and free! Thank you, thank you. Both cursors compliment too. Any chance of a 'rainy' for a full set? 10081991: Thank you, glad you like it. I'm afraid I don't know how to skin rainmeter, but if someone wants to make one that's fine with me! Woohoo, it's finished! I'm going to love using this set, Bry. Thank you very much for such a fabulous theme. Oh, and I was going to ask if you'd mind me making a Rainmeter to match. What a coinkidink! StarCandy: Sure, you can be the official rainmeter skinner for this...... If you need anything from me, just let me know.......... Have Fun!! Ooops - I meant a Rainlendar skin. 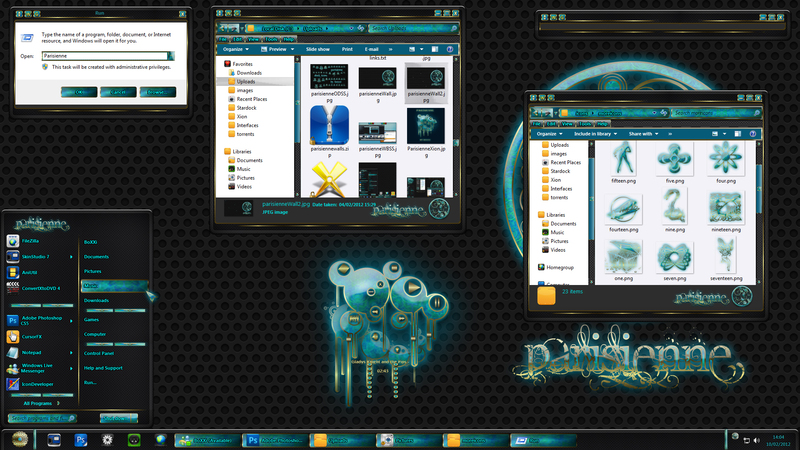 But looked up Rainmeter and that looks good. Sorry. But - any chance any of you clever skinners can try - with permission of course. Super skin.